On Sunday August 17, 2014 all of the descendants of Charles Hill and Ada Woolgar met for the 54th Hill Family reunion. The reunion held at the Rockmosa Community Centre in Rockwood, Ontario brought members of the Hill family together from all across Ontario to share stories, learn about our history and to create some new memories. At the gentle urging of my father, Howie Hill, I put some of my genealogy work to good use. I put together a descendant chart for Charles Edmonds Hill and Ada Elizabeth Woolgar. I had no idea what I was getting into, but I knew that it was possible. Utilizing Family Tree Maker, which links to my account with www.ancestry.ca, it was fairly easy to pull together all of the information. By playing with all the settings and getting all the names on the chart I was astounded to see the number of pages needed to lay out the chart. 102 pages! All laid out hit was asking for 102 horizontal 8 1/2 x 11 pages. I played around with the settings, changed the orientation to vertical and I was able to fit it all onto 43 pages. 43 pages of family. My family. Each of those children had children of their own save one, Charles Edmond Hill, who passed away at a young age due to scarlet fever. Those children had children and even those children had children. The Hill family has grown exponentially since arriving in Canada back in 1908 and nothing proved it more than rolling out the pages across the room for everyone to see. The chart seemed to keep going and going and as members of the Hill family walked along to find their name it made one thing clear: this wasn’t everyone. Pencils and pens were brought out and the new names of the next generation were added. Issues with spelling and further details were added and the tree continue to grow. In all, 47 extra names were added to the tree. 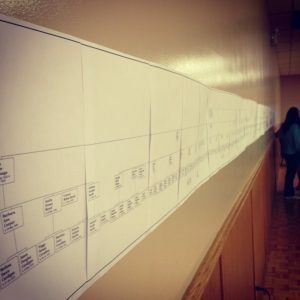 Looking back over the chart, it is astounding to think of all the names and relationships in the Hill family. 604 names. 604 descendants. I knew the Hill family was big, but I had no idea it was that big. I wonder how many more names will be added next year at the 65th Hill Family reunion, 3rd weekend in August, Sunday in the same location and at the same time. Our family hasn’t been in Canada long but we have sure helped to populate it! 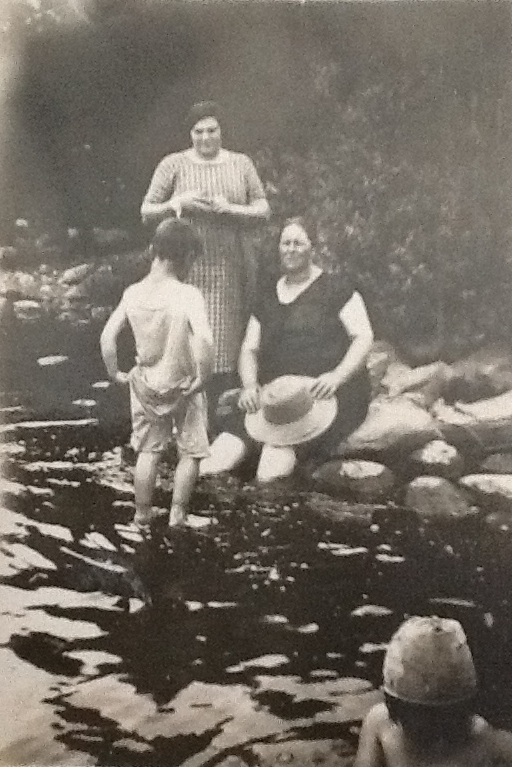 With the heat of summer, I am reminded of some black and white pictures I found of my great grandmother Ada Elizabeth (Woolgar) Hill. 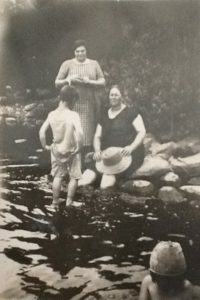 On what must have been an incredibly hot summer’s day, Ada took off from the housework and went to the swimming hole near her home in Wellington County, Ontario, Canada. All the stories I have heard about her, she was an incredibly hard working woman. She was always busy doing something around the house. With 13 children, you can imagine how good it would feel to take a break from the chores, dip your toes in the water and just relax. Stop sweeping the endless amounts of dirt. Take a break from preparing mountains of food, doing laundry, tending gardens and just relax. The pictures are not that clear but the feeling is. Peace and happiness. Oh Ada. How much I wish I had known you. All of the stories I have heard about you came from people who didn’t know you as a young mother. Those that only got to know you later in life. Ada who was born in England but became the matriarch of the Hill family in Canada, your records in your bible have helped me better track our family history. You helped set me on my way and have helped me grow our family tree. And now over 50 years after your death in 1962, I look at these pictures and I think of you and smile. 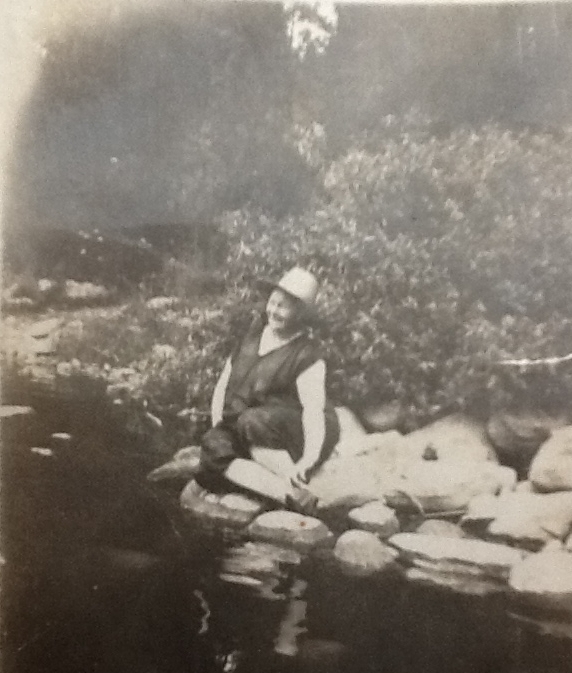 If you would like to learn more about my great-grandmother Ada Elizabeth (Woolgar) Hill, read this blog post from April 2014.